With this easy, organic grow kit, you can grow beautiful, wonderfully aromatic lavender flowers at home. The breathtaking, heaven-scented lavender fields of Provence or Croatia may be out of reach for the moment (sigh). But with this easy kit, you can grow an indoor version at home. Everything you need—lavender seeds, organic soil, and instructions—is packed in a pretty, handmade ceramic planter, glazed the same color as the flower. Lavender is naturally easy to grow, and doesn't need a lot of care once established. Once mature, use your aromatic lavender for cooking, crafting, cleaning, cosmetics, sachets—or leave it in its purple pot, looking and smelling wonderful. Kit comes with enough seeds for 5 full grow cycles. Fans of this flower and beginning or experienced gardeners will swoon over this easy avenue to lavender loveliness. Made in China, and assembled in California. Place some stones or gravel at the bottom of the pot for drainage, then pour the included soil into grow container and pack down gently. Place 4-6 seeds 1/2 inch below surface of soil and place grow container on small plate or saucer. Water gently and place in area with direct sunlight (or under grow light). Water daily. Hope this one is not a dud! The first one we ordered did not grow. I will keep the pot but have to buy fresh seeds. I woukd recommend to a friend if they wanted a nice pot. Lots of love and lavender! Received this item as a gift. Kit was all inclusive including soil, seeds, and container. 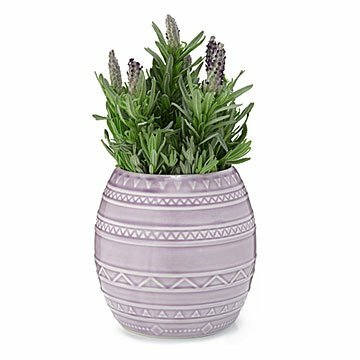 The ceramic lavender container is a lovely shade of purple with textured sides. I love that the container has a sealable wooden lid incase I would ever want to use the container for other purposes. Instructions were simple to follow. Looking forward to beautiful blossoms this spring! The vase is beautiful! I am just waiting for the sun to come out so I can plant! I was so happy when it arrived! Loved this gift. Came with all you need to grow a beautiful lavender plant. The pot was pretty too. Perfect for a 20-something with a new apartment.